Since its inception in 1972, La Casa de Don Pedro emerged from a period of social unrest in the late 1960’s in Newark, New Jersey as an activist, community-based, grassroots organization committed to empowering the then marginalized Puerto Rican and Latino community. Named in honor of Puerto Rican nationalist, Don Pedro Albizu Campos who advocated the twin virtues of self-sufficiency and empowerment, La Casa was born out of collaborative and unifying efforts to reverse the trajectory of social, cultural, political, and economic dislocations and marginalization of children and families. 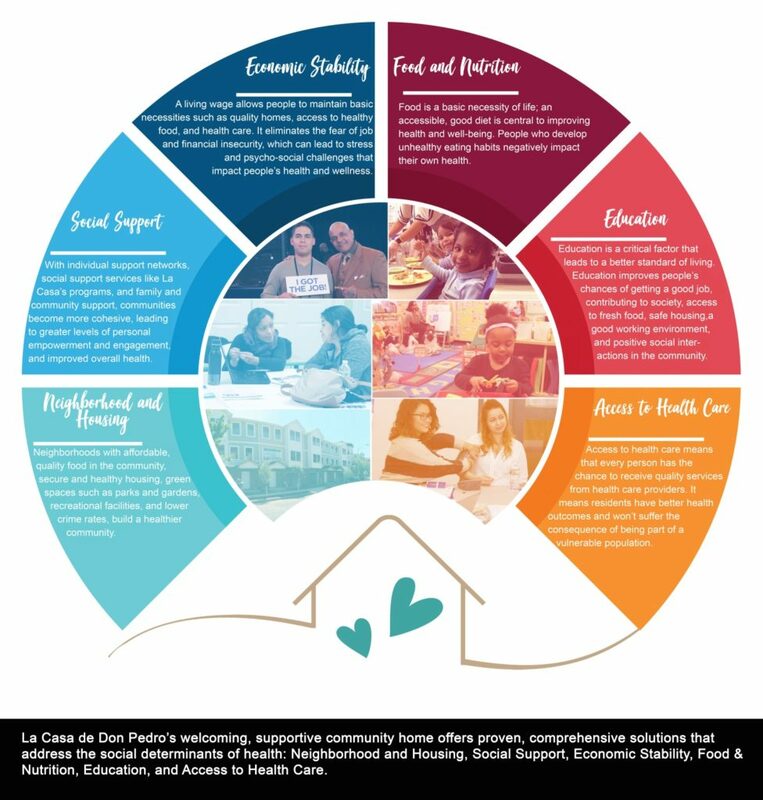 La Casa’s values are driven by our mission to foster self-sufficiency, empowerment, and neighborhood revitalization, and our deep-rooted history of shared experiences with our community. Recognizing the community’s adversity, we emphasize, celebrate, and nurture core values of advocacy, responsibility (civic, personal, fiscal), education, home, diversity, and creativity in a culturally sensitive and caring environment. With more than forty-five years of mission-driven and visionary service, La Casa has an expansive service delivery model designed to meet the ever-changing needs embedded across the life cycle of the children, individual, and families in Greater Newark, New Jersey’s under-served communities. Our programs are comprehensive because we recognize that the needs of individuals, their families and their children tend to be interconnected, requiring a holistic approach. We are also integrated, linking the available resources and shared values of equal opportunity, inclusiveness, and responsibility. La Casa provides expanded, multidimensional services in the following areas: early childhood development, youth educational, cultural and recreational programs, youth & family counseling, health initiatives, HIV/AIDS prevention & services, WorkForce development & job placement, affordable housing development and counseling, community development and organizing, Lead Safe Home Remediation, and home energy assistance, and home energy conservation. Each year La Casa serves more than 50,000, people largely in Greater Newark and Essex County. The organization’s primary service area is Newark’s North End, with a targeted comprehensive community development initiative for the Lower Broadway community. Our community reflects a diverse demographic profile of a largely Hispanic and African-American population. La Casa has served as the signature organization in the landscape of social services and community development in Newark for all residents, while maintaining its community organizing and social service delivery system as the primary link to the largest Hispanic community in New Jersey. With 280 employees, 50 volunteers, and a FY2019 operating budget of $24M, La Casa has the capacity to handle its extensive roster of initiatives. Programs are managed by five separate divisions: Early Childhood, Youth, Family & Health, Personal Development, Community & Economic Development, and Community Improvement. La Casa’s hyper-localized approach to social and economic prosperity helps influence policy at multiple levels and in multiple sectors. Through membership in city, regional, and statewide coalitions on topics like early childhood education, community development, health, and workforce, we offer a perspective on issues and trends impacting our community often absent from high level policy discussions. We continue to seek to be engaged in opportunities that further advance our team’s learning and sharing at a broader, national level. Change is the one constant in our community and La Casa continues to evolve in-step with our constituents and surroundings. To help us address our changing climate, we are starting a 2018-2022 strategic plan. The full 2013-2018 strategic plan can be viewed here. No matter the plan, as we consider the future, La Casa’s staff, management and Board strive to serve the community within a framework of commitment, professionalism, transparency and the highest level of service possible. At La Casa, our history and our mission define who we are and what we do.